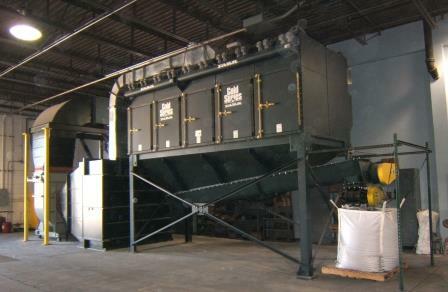 A dust collector is a key component in the safety of almost every dry processing plant. Here are 10 ways to make sure your dust collection system lives up to the tasks of keeping workers safe, maximizing production uptime, and meeting regulatory compliance. If your dust collector handles combustible dust, you must equip it with deflagration protection. Although there are many forms of deflagration protection, a common, cost-effective passive method is venting. An explosion vent opens when predetermined pressures are reached inside the collector, allowing the excess pressure and flame front from the deflagration to exit to a safe area. It is designed to minimize damage to the collector and prevent it from blowing up in the event of a deflagration, thereby reducing the hazard. A flameless vent is designed to install over a standard explosion vent and extinguish the flame front exiting the vented area, not allowing it to exit the device. This allows conventional venting to be accomplished indoors where it could otherwise endanger personnel or ignite secondary explosions. If you cannot vent the pressure wave and fireball to a safe area, discuss another method with your dust collection professional. Understanding the pressure capabilities of your collector is import in the specification and selection of vent sizing. Comparing venting vessel strength to the deflagration strength and vent burst pressure are key to effective deflagration protection. Some of the combustible dust properties required to understand this concept are described by the Kst (bar m/s – normalized rate of pressure rise) and Pmax (bar – maximum pressure for an unvented dust explosion) values (Figure 1). As Figure 2 shows, burst pressure of the event is designed to be lower than enclosure strength, which will relieve the pressure of the deflagration before it can build to levels that would destroy the collector enclosure. Moreover, enclosure strength of the dust collector is an important factor in sizing the deflagration protection equipment because even with venting there will still be significant pressure increases during an event. A heavy-duty collector made of thicker gauge metal with greater vessel strength will survive better in the event of deflagration and can often continue in service with only the explosion vent and filter cartridges needing to be replaced. In addition, using a heavy-duty collector will let you integrate a simpler and less costly deflagration protection system to comply with National Fire Protection Association (NFPA) standards. Even if a collector has rugged construction and a properly sized deflagration vent, NFPA requires protection for the ductwork and safety processes upstream of the dust collector. Equip the ducting with dampers and isolation valves designed to minimize the risk of deflagration within these components. A flow-activated passive inlet isolation valve protects downstream work areas and processes from the propagation of flame and pressure through the inlet duct when deflagration occurs in a dust collector. During deflagration in a dust collector, the pressure wave will close the valve preventing the passage of flame and smoke to areas upstream from the valve. The valve latches shut and must be manually opened. If activated, components of the valve may be damaged and a thorough inspection is required prior to returning the valve back into service. NFPA requires the ductwork between the dust collector and isolation valve to be two times the reduced pressure after venting (Pred). Be sure that your isolation device meets the latest NFPA standards. Most factories that process powder and bulk solids routinely store products in hoppers. However, the hopper required with a dust collector should not be used to store dust. The hopper is only intended to funnel process dust to a storage bin. Dust that has accumulated in a hopper creates a potential fire or deflagration risk. Dust in the hopper may also diminish the collector's performance by clogging the system and preventing the pulse-cleaning from doing its job. Self-dumping hoppers provide easy dust disposal while protecting against unwanted dust leakage between the collector and hopper. A slide gate and flexible quick-disconnect hose connect the two components together, and the hopper lid is fastened with rubber clamps that create a gasketed seal to prevent dust from escaping. When the hopper is full, the user detaches it from the bottom of the collector, lifts the hopper onto a fork truck, and simply pulls a lever to swing the lid open and dump the contents into a larger disposal container. Self-dumping hoppers are used for a range of dry dusts, including those that must be reclaimed or recycled after the collection process. The dust collector's cleaning system design works in conjunction with filter design. Selective cleaning controls provide an easy, maintenance-friendly way to keep filters clean. Operators can select from continuous cleaning, on-demand cleaning and downtime cleaning. On-demand cleaning is recommended for most dust types. This setting monitors the differential pressure across the clean-air section and the dirty-air filter section of the collector. On-demand cleaning allows you to set a very narrow range of differential pressures to activate and stop the cartridge cleaning. This setting uses the least amount of compressed air and provides optimum filter cleaning efficiency and filter life. Note that the on-demand settings will need to be adjusted to compensate for the slow but continual rise in filter pressure drop over the life of the filter set. Downtime cleaning allows for time-based pulsing at the end of a plant shift, after completing a batch process or after an upset condition that may affect the filter's performance. Downtime cleaning allows operators to shut off the fan and clean the filters during a set duration of time. After the cleaning period is finished, the unit will shut off completely. This is an important feature because over-cleaning the cartridges during operation causes higher emissions, shorter cartridge life and higher energy costs due to overuse of compressed air. Filter percentage efficiencies and Minimum Efficiency Reporting Value (MERV) ratings to predict compliance don't tell the whole story. The MERV scale provides a good indicator of a filter’s initial efficiency. However, it does not measure pressure drop, emissions while pulsing, energy performance, or the other parameters that better reflect dust collector efficiency. The EPA and OSHA want to know that emissions will be at or below their required thresholds. Ask the filtration manufacturer for a written guarantee of emissions performance stated as grains per cubic foot. A way to measure your dust collector's emissions effectiveness is to test it according to the recently published ANSI/ASHRAE Standard 199-2016, Method of Testing the Performance of Industrial Pulse Cleaned Dust Collectors. This standard is designed to help end users evaluate collection equipment with much greater accuracy. The test measures four key performance parameters: Emissions, pressure drop, compressed air usage, and emission reading. Before this standard was enacted, there wasn’t an appropriate test standard to measure the effectiveness of dust collectors and filters. End users could not get the data required to do apples-to-apples comparisons of how different collector designs and filter options affect factors like emissions and energy consumption. Ideally, your workers should never have to enter the dust collector to change the filters. Dust collectors that require entry during service, put workers at risk and require companies to file confined space entry permits and monitor for gas. Many cartridge-style dust collectors offer ease of filter change-out. For optimal safety, filters should be positioned for ease of access and slide in and out of the housing readily. Simple, quick-open heavy-gauge doors can provide access to a fast cartridge change-out system that does not require entry into the collector. Look for doors that are fully reversible for access from either side and have an exclusive lock-out feature for worker safety. Pulling out a dirty overhead filter that weighs 100 pounds can result in neck, back, and foot injuries. Avoid threaded connections on the filter access doors or hoppers because dust tends to build up in the threads and cause connections to stick. Camlock-style devices are not subject to this problem and make for easier service. A simple but important safety requirement is to change filters when airflow through the system reaches a differential pressure limit as prescribed by the manufacturer or when the pressure drop across the collector is negatively affecting the ability of the dust collection system to capture the dust, thus allowing it to escape into the facility. Some long-life cartridge filters can operate for two years or even longer between change-outs. However, for heavy dust-loading applications, filter replacement might be much more frequent. Moreover, extended-life cartridge filters can reduce replacement frequency and minimize worker exposure to dust. Reducing filter change-out frequency also saves on maintenance and disposal costs and reduces landfill impact. Ask your filter supplier for a written guarantee on filter life. For spark-generating applications, a range of features and technologies are available, from flame retardant filter media to spark arrestors in the form of drop-out boxes, perforated screens or cyclone devices installed at collector inlets. Fire sprinkler systems may also be required with some installations. Dust collectors that use vertically-mounted cartridges also reduce fire and deflagration risks. With horizontally-mounted systems on heavy dust loading applications, dust becomes trapped at the top of the filters, and there is no pre-separation of heavy or abrasive particles from the air stream. This situation can shorten filter life and provide a dusty surface for sparks to ignite. Vertical mounting reduces heavy loading dust on the filters and helps eliminate these problems. You can further enhance your dust collector's safety performance, with additional safety accessories. For example, OSHA-compliant railed safety platforms and caged ladders can prevent slips and falls when workers access the collector for service. Lock-out/tag-out doors prevent injury caused by the inadvertent opening of doors during a pulsing cycle and/or exposure to hazardous dust. Where highly toxic dust is being handled, a bag-in/bag-out (BIBO) containment system may be required to isolate workers from used filters during change-out. You might also want to equip your collector with a safety monitoring filter. This is a secondary bank of high-efficiency air filters that prevent collected dust from re-entering the workspace if there's a leak in the dust collector’s primary filtering system. A safety monitoring filter is a required component in a recirculating dust collection system that recycles air downstream of the collector. By recirculating heated or cooled air back through the plant, the cost to replace that conditioned air is eliminated, with rapid paybacks in energy savings. Another advantage of recirculating systems is a reduction in regulatory paperwork. By containing the air indoors, you can avoid the time-consuming permitting involved when contaminated air is exhausted outside. Consult your dust collection professional to determine if safety monitoring filters and recirculating the air are possible in your application. These are a few significant areas of attention that can enhance the safety of your dust collector. Partner with your equipment supplier to help you assess your system, applications, and physical space for the best solutions for keeping your workers safe and your processing operation in compliance. Rick Kreczmer is director of aftermarket at Camfil APC, a global manufacturer of dust, mist, and fume collection equipment. He can be reached at 800-479-6801, 870-933-8048, or [email protected] For more information on Camfil APC, visit camfilapc.com.